As the recognition of Cut quality has grown over the years, the popularity of hearts and arrows diamonds has grown proportionately. Hearts and Arrows Diamonds, originating in Japan in the 1980s played an important role in promoting Cut quality of diamonds. The interest in Cut further led to increased research and development including the AGS Cut grade introduced in 1996. Eventual research in Cut quality has led to a consensus of it being the most important of the Four Cs, greatly contributing to the overall beauty and brilliance of a diamond. Hearts and Arrows is a form of Optical Symmetry found in Round Brilliant diamonds which are cut to Ideal Hearts and Arrows proportions that have superior Optical Precision. When and only if a diamond is cut so exactly by a master cutter that their facet reflection overlap in 3D space, is a hearts and arrows diamond born. This kaleidoscopic pattern of hearts is visible in the face down position and arrows in the face up position using a Hearts and Arrows Viewer (fig.1-1). fig.1-1: A CIH H&A Diamond with Hearts(L) and Arrows(R) Patterns. The alignment of a diamond’s facets and their interaction together is what controls light reflections of a diamond creating the hearts and arrows pattern. This interaction of facets is know collectively as Optical Symmetry, 3D Symmetry or Optical Precision. The facets of a diamond behave much like mirrors where light bounces from one to another. The precise alignment or tuning of these facets leads to the ideal reflection of light back at the viewer. Optical symmetry should not be confused with physical “meet point symmetry”. Meet Point Symmetry relates to facet junctions meeting equally and is listed as the Symmetry grade in lab reports and is separate from optical symmetry. Optical Symmetry can be summarized as being the reflective result of overall physical symmetry in a diamond. Consumers admire the precision of hearts and arrows diamonds by using instruments such as a hearts and arrows scope and other analytical tools. Others marvel at the level of craftsmanship required at the hands of a master diamond cutter in turning a rough diamond into a polished stone in which each and every facet is tuned to work in harmony and collectively to produce the perfect diamond. The question remains as to the real life benefits or need for this level of optical symmetry and craftsmanship. 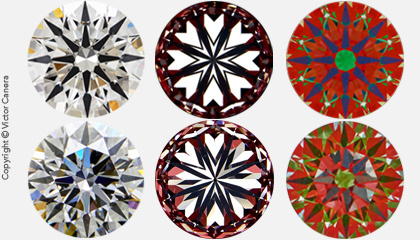 Hearts and Arrows optical symmetry in a Round Brilliant diamond delivers numerous and tangible advantages to the consumer over standard round brilliants. These benefits include a facet pattern that is symmetric with increased contrast resulting in delineated arrows visible in the face up position. H&A optical symmetry also produces the ideal balance between brightness, fire and scintillation which are visible to the naked eye. fig 1-2: (L)A standard GIA Ex,Ex, Ex, Round. (R)A CIH Super Ideal Hearts & Arrows Diamond. Our eyes have been proven to be attracted to symmetry in nature and confers beauty upon items that have balanced proportions and symmetry in them. 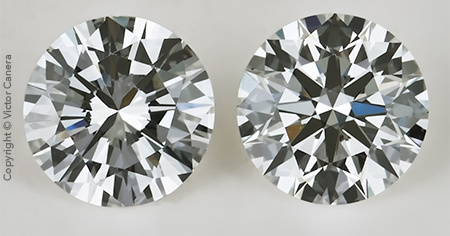 A discernible difference with a hearts and arrows diamond, as opposed to a standard round brilliant, are the crisp, balanced proportions of the diamond in the face up position (fig.1-2). H&A optical symmetry produces a structured and crisp facet pattern including eight arrows which are clearly delineated to the naked eye. This results in a diamond with specific areas of contrast and brightness. fig 1-3: Top:CIH Super Ideal Hearts & Arrows Diamond. Bottom: A Standard Round Brilliant Diamond. A typical polished round brilliant diamond has 57 physical facets. A diamond though can reflect hundreds of sparkles of light creating a mosaic of flashing geometric shapes known as Virtual Facets (fig 1-3). The cumulative sparkles of all of these flashes by Virtual Facets creates the dynamic reflective beauty of a diamond. Virtual Facets is simply a term used for reflections of light produced from physical facets. fig. 1-3: Virtual Facets in a Round Brilliant Diamond. Courtesy AGSL. Hearts and Arrows diamonds like the Canera Ideal Hearts diamond produce the least amount of virtual facets within the context of a round brilliant cut diamond. These smaller number of virtual facets translate into fewer yet larger virtual facets. Larger virtual facets return a stronger intensity of light. Round Brilliant diamonds not having H&A optical symmetry may have more numerous virtual facets that emit weaker intensity of light. A virtual facet reflecting a single flash of light or fire are commonly referred to as giving off an “event” small “events” are termed “pin-flash” reflections. An observable flash of light by a virtual facet is termed an “effective virtual facet”. Virtual Facets that emit flashes that are so small as to not be visible are termed “ineffective virtual facets”. A diamond having superior hearts and arrows optical symmetry produces the best balance of observable large events and smaller “pin-flash” “events” of flash and fire. The general consensus is that people tend to prefer bolder flashes to smaller pin-flash events. This propensity towards emitting bold flashes is amplified by ideal hearts and arrows proportions such as with Lower Girdle Facets (LGF). The ideal H&A Lower Girdle Facet range found with true H&A diamonds of 75-78% produce broad spectrum sparkle as opposed to the smaller pin-fire like sparkle found in standard round brilliants with LGF percentages of 80% and higher. There are many misconceptions as to what constitutes an “Ideal Cut Diamond”. It is possible for a diamond to have hearts and arrows optical symmetry yet suffer from Light Performance issues such as light leakage or obstruction. A diamond may also be crafted to ideal proportions and achieve the coveted AGS 000 score without having superior optical symmetry with crisp patterns of hearts and arrows. A diamonds which balances both superior hearts and arrows optical symmetry AND Ideal Light Performance are termed “Super Ideal Hearts and Arrows Diamonds”. The Canera Ideal Hearts Diamond is a Super Ideal Hearts and Arrows diamond because of its superior hearts and arrows optical precision in addition to Ideal Light Performance. The addition of hearts and arrows optical symmetry with superior light return characteristics results in increased contrast and consistency in performance and a higher intensity of light being reflected by the diamond. Hearts and Arrows optical symmetry is the verification of a precision cut diamond due to their extreme sensitivity to even the slightest deficiency in symmetry. It’s important to note that hearts and arrows do not cause a diamond to be brilliant. Hearts and Arrows are an effect of a perfectly proportioned round brilliant diamond. As such, they represent the pinnacle of diamond cut quality and craftsmanship. Only when facets are harmoniously tuned together where their reflections overlap in 3D space are hearts and arrows patterns created. Some benefits of H&A diamonds are a symmetric facet pattern with clear areas of contrast and brightness, bolder and more intense flashes of light and a perfect combination of brilliance, fire and scintillation. The union of Ideal Light Performance to superior optical symmetry such as with the Canera Ideal Hearts and Arrows Diamond results in a Super Ideal Hearts and Arrows Diamond.